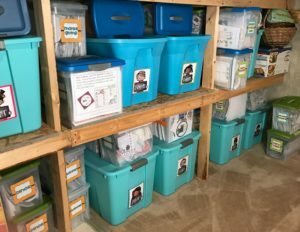 Last summer when the Debbie Diller book study was the place to be, Oceans of First Grade Fun’s, Yoland made this great game for working with 10s and 1s called Race to 50. I loved the game, but knew that it would be a bit difficult for my kindergarten students starting out. So here it is. I altered it to meet my students level of readiness where they are now rather than trying to give them something that would be too frustrating and difficult. 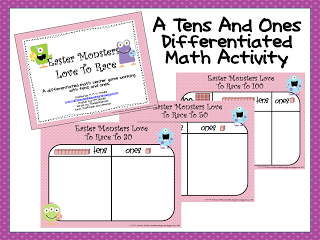 It is tiered to meet my students just beginning to work with 10s and 1s (Race to 30) and there are two other levels (Race to 50 and Race to 100) for students who need more of a challenge. I do hope that if you find it useful you will give me a shout out. You can grab this freebie by heading over to my TpT store or by clicking here or on the game’s picture above. While you’re at my store, check out my new items for Easter I just listed. I’m a little nervous. These are the first two products I’ve actually put out there for people to purchase. Of course, they are tiered to meet the readiness levels of all your learners. 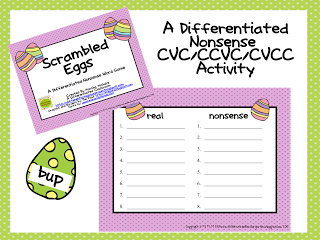 The first product is a differentiated nonsense word/cvc/ccvc/cvcc activity. And the other is an activity to get your kinesthetic learners up and moving while they write the room with this subtraction activity. I sure would love to hear any of your feedback on them.